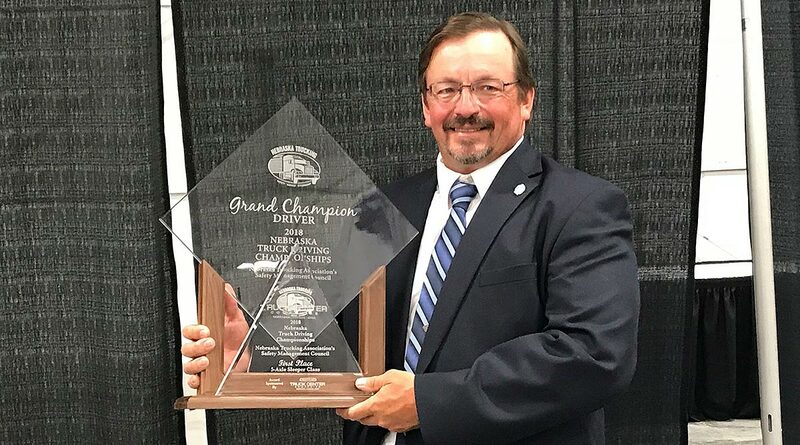 Nebraska 2018 Grand Champion Tim Dean has won eight state championships, placed second at the National Truck Driving Championship in 2009 and served as a member of the 2009-2010 America’s Road Team. To say he is experienced is an understatement. His trucking career began 30 years ago as a way to make money. Now 54, Dean has 3.9 million safety miles and spends time mentoring younger truck drivers. As he prepares for nationals this year, he isn’t scared — he’s excited and nervous. He has gathered skills for the competition by practicing often. This year, he took first place in the sleeper berth category, which is the same kind of truck he drives for Werner Enterprises. Practicing has sharpened his depth perception and competing has allowed him to refine his driving skills. “We spend our whole driving careers staying away from everything, so to be able to compete at a truck driving championship and score the maximum points, you have to train yourself how to get close without hitting it,” said Dean, who is from Omaha, Neb. One of the highlights of his career was being a member of America’s Road Team. He said he was honored to be selected. After being a member of the team and educating the public about trucking, he had a new perspective on the importance of the job. Dean said his greatest joy is helping fellow truckers achieve what he has accomplished in his trucking career. He is a mentor for Werner Enterprises Road Team members and helps truckers prepare for competitions. Some of them even qualify for nationals. The most important lesson he has learned is how to be a safe, courteous and professional driver. Dean takes pride in the amount of time he has gone without an accident. For him, the greatest reward of trucking is the job itself: safely delivering items from one place to another.